Even in the painted world there are people who are fond of motorcycles and are ready to spend hours on them and even participate in various kinds of competitions. 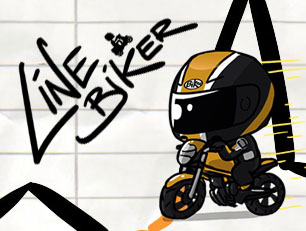 Today in the game Line Biker you will take part in one of these competitions. You will need to drive along the road which is a line. It will not be even and have many sharp peaks. You sat behind the wheel of a motorcycle and you will have to zip along this road and come to the finish line in the strictly time available. In this case, you will make a lot of jumps and tricks on a motorcycle. The main thing is to keep the balance and do not fall, or you will lose.